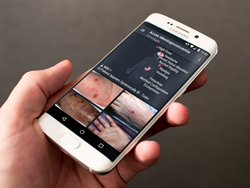 The award-winning visual clinical decision support system now available on iOS and Android devices. “VisualDx is my go-to tool.. By providing me a visually integrated second opinion, I can quickly provide my patients the care they need,” said Tyler Shelton, PA-C, Florida Emergency Physicians, VisualDx Beta User. VisualDx announced today its next generation app is now available for iOS and Android devices. VisualDx is the first point of care diagnostic support system to be widely used, and has expanded to include diagnostic support across general medicine. The system speeds diagnosis, therapy decisions and patient education for emergency physicians, hospitalists and primary care clinicians worldwide. VisualDx’s new app provides excellence in clinical decision-making with new and expanded content across general medicine. Among the key new features, the ability to see variations in 2,700 pediatric and adult diseases with over 34,000 images and exclusive Sympticon™ technology. More than 14,000 searchable medication reactions and adverse events are also included in the new VisualDx. Clinicians can build a differential diagnosis in seconds by entering a chief complaint or use the powerful search function to access patient-specific clinical information and images. As the world’s most widely used clinical decision support software, with VisualDx doctors and health care professionals have the best app to make accurate, informed diagnostic decisions at the point of care. “The VisualDx app is very user friendly and fast. As a busy clinician in emergency medicine, VisualDx is my go-to tool to access content and fill in any knowledge gaps. By providing me a visually integrated second opinion, I can quickly provide my patients the care they need,” said Tyler Shelton, PA-C, Florida Emergency Physicians, VisualDx Beta User. “In today’s fast paced medical world, we understand the need for accessibility. The new VisualDx apps allows clinicians access curated, peer-reviewed images and information to enhance diagnostic accuracy, aid therapeutic decisions, and improve patient safety,” said Art Papier, MD, chief executive officer, VisualDx. VisualDx continues to be recognized for its innovative approach to decision support and its ability to assist with fast, more accurate diagnoses. Its apps have been rated as one of the best by both Harvard and University of Pennsylvania. The company was also recently recognized as Best in KLAS Category Leader Clinical Decision Support -- Point of Care Clinical Reference for the 5th consecutive year. Both apps are available for download in the Apple App Store or Google Play. Free trials are available.